Would you like to make something with a lot of connections? For example a music amplifier? 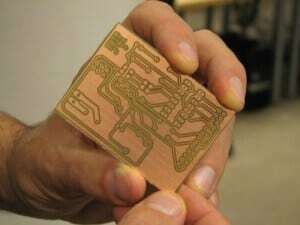 …then designing a printed circuit board (PCB) will make your life much easier. It’s what will take you from knowing how to build simple circuits to being able to build advanced stuff like LCD screens, Quadcopters, etc. In my last email I promised to send some resources on how to design a PCB. You start out with a circuit diagram. You can design your own, or you can find free designs that others have made. Now, how do you turn this into a circuit board? For another 1.5 days, you can get 10 boards manufactured for only $7.9 at Seeed Studio’s Fusion PCB.